For a waterbed this one’s pretty expensive, but because of its features I think it’s a good one and deserves your consideration. What you get is a complete set – mattress plus foundation. You also have the option to add bed legs, but you have to pay additionally for them. The mattress is what we’re gonna focus on. In my opinion it has everything you need. You get the comfort of the water tubes, the sides are reinforced making its use easier, there’s a foam layer on top of the tubes, providing additional support and preventing body heat loss. There are single low-watt heater and fill and drain kit included in the offer. You also have the option of upgrading your mattress by adding bed legs, waterbed pump or additional heaters if you’re getting a bigger size mattress. There’s no reason to dislike this mattress. 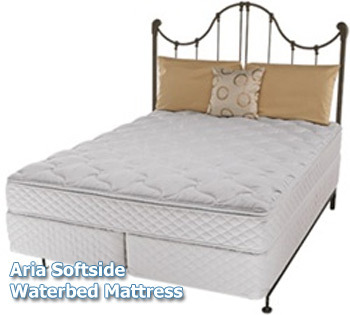 If it’s your first waterbed mattress you may need some time to adjust to it, but in a short while you’re gonna love it. As I mentioned the price is a little high for a waterbed, but again totally worthy. Different sizes cost different, but you have plenty of sizes to choose from. Starting with the Twin – (38” x 75”) costing $1299.99, Twin XL (38”x80”) again for $1299.99, Full (54”x75”) for $1349.99, Queen (60”x80”) for $1399.99, King (76”x80”) for $1499.99 and Cal King (72”x84”) again for $1499.99. Remember those are the prices for the complete set. If you don’t want the foundation you’ll get some money back. An additional heater costs $49.99, to add bed legs you also have to pay an additional $49.99. The water pump will cost you an additional $69.99. Don’t ignore this offer. Think about it. The mattress is really a good one.